Nosto features a product update tool, which allows full re-indexation of product catalogue to Nosto. 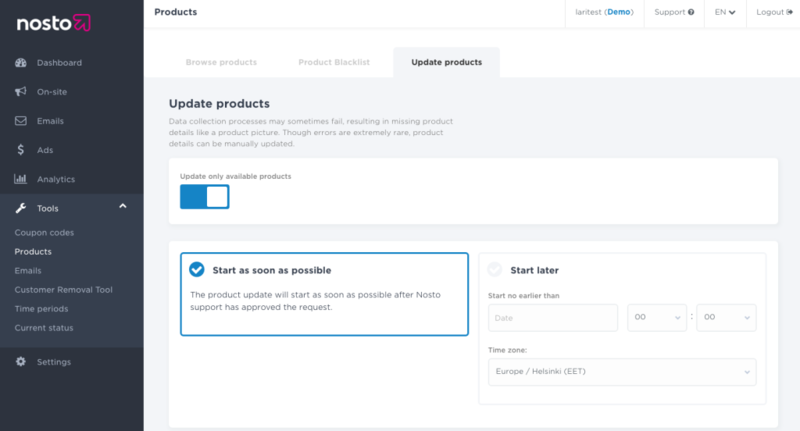 A full update is rarely necessary, but in the event site-wide changes to the Nosto implementation are deployed or when a significant update to prices or to other product attributes is applied on the site e.g. during a start and an end of Black Friday or Virtual Monday sales, you might need to update all product data at Nosto by requesting a one-off full update. A full re-indexation will effectively keep the product information such as price and product images consistent with your site’s data. A full re-indexation is needed only if a site has been implemented using Nosto’s general tagging method, but in case you have implemented a product update process leveraging Nosto’s API, a manual re-indexation is in most cases not needed as Nosto receives product updates directly from your store’s back-end in real-time. Following e-commerce platforms and softwares have built-in automatic update functionality from the site’s back-end, meaning that an update process is automatic and re-indexation needed only if the back-end integration has been changed. Read more details here. An update is requested and executed under menu Tools > Products > Update Products-tab. Update only available products is by default on as the setting queries only details of products that are currently available, and are therefore relevant. Start as soon as possible files a request for re-crawl to be executed immediately when possible. Start later allows scheduling and starting the update process on a given time, for example immediately after changes to prices have been applied on your site itself. Single product updates can be executed using the Nosto debug toolbar and under browse products.